Use VPN only for US Netflix? Then CactusVPN is simply the best option for the best price. CactusVPN distinguishes itself from the competition by making a very specific offer. On the performance side we are also very pleased with CactusVPN. Moldova - Not a Fourteen Eyes Country AND Not an Enemy of the Internet. CactusVPN is one of the more recent players on the market. But offers a refreshing take on VPN services. The things they do are a bit different from competitors, adding a small but unique VPN service to the line-up of available VPN providers. CactusVPN owns a small fleet of twenty VPN-servers, located in nine countries. Most are in the largest markets, like the USA, UK, Canada, the large European countries, Australia, and South-Korea. Please note the use of Bittorrent is only allowed on servers in Holland and CactusVPN’s home turf, Moldova. This small fleet (in comparison to other VPN services) covers your browsing activities in prominent territories. But more important, they offer a service that is of the highest quality. Servers are without exception quick, reliable, and well secured. Internet speeds test just slightly lower than those of the quickest VPN-providers. But are high enough to allow steady streaming, browsing, and downloading. CactusVPN supports streaming American Netflix, and UK’s BBC iPlayer services, and that’s putting it mildly. The company clearly made their support a key tenet in their strategy, which shows in their subscriptions. Specific servers are kept in reserve for circumventing geoblocks, spewing out new IP-addresses on demand, and around the clock. This arrangement generally makes for some very smooth streaming. There is one caveat though: this setup is prone to slowing down when traffic on those servers is high. Plus, of course like any VPN geo blocking service this setup will only last as long as it lasts. Streaming services like Netflix constantly try to block new IP-addresses associated with VPN. The availability of local, smaller streaming services is expected to last a while longer, giving expats every reason to use VPN to check in on shows in their home country. 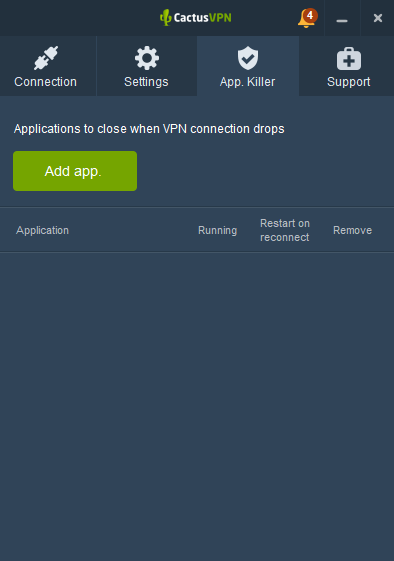 The apps you use to connect to a VPN server are streamlined and efficient. Connecting to a standard server is easy as pie, and people aiming for more complicated setups will be satisfied as well. Dig a little deeper into the apps, and you’ll find options to switch encryption protocols, switch to a new server location, or engage (or disengage) extra protection against DNS-leaks. Connecting your smartphone or tablet to a VPN server is a snap too. Each subscription gives you access to three separate VPN connections. Which should be more than enough for most users. The only (logical) restriction here is you can’t use one of these connections for more than one device. The relatively small size of CactusVPN’s server network hardly registers in the up- and download speeds we clocked while testing the service. You can stream effortlessly within European and US borders, and even we detected little lag on our connections. Just enough to advise against using CactusVPN in full security mode for online gaming, especially when dealing with US servers. Real speedfreaks will want to check the Smart-DNS service CactusVPN offers with some of its subscriptions (it also sells as separate subscription), which changes your IP-address without the layers of encryption used in VPN. You basically use the Cactus server network without the protection, which of course makes you more vulnerable to leaks and such, but also increases your up- and download speeds considerably. Making Smart-DNS an interesting option for people who are looking at legal streaming services. Most VPN providers offer monthly and yearly subscriptions that give you access to the full service. CactusVPN’s subscriptions take a different approach. Consumers pick the services they (think they will) need, and only pay for those options. Five different subscription types are available in this catering model, and each one offers lower monthly fees for longer subscriptions. For users who simply want to use VPN to stream content from the US or UK, CactusVPN has two options at a very low price. You’ll get access to US and UK VPN-servers for a fixed fee of 4.99 dollar a month, or 3.25 dollar a year. Free VPN’s are available, but we don’t recommend using these. Other users may want to look at the Liberty VPN-subscription, tailored to the needs of people looking for safe countries to browse the internet from. This subscription gives access to servers in the Netherlands, Moldova, and Germany. Countries where free speech is upheld and you can express yourself online without fear of prosecution. The same fixed fee (4.99 dollar a month, or 3.25 dollar a year) applies to this subscription model. While these subscriptions are relatively cheap compared to the offers of competitors, others are expensive. An extensive subscription with access to every option available (including Smart-DNS) sets you back 17.99 dollar per month, or 4.59 a month if you opt for a yearly subscription. A Smart-DNS is available separately for 12.99 dollar per month, or a lower fee depending on the length of your subscription. Some VPN-providers use complicated language to obscure the fact they keep logs of your internet browsing, but CactusVPN is not one of them. The company is very clear about what they store (and don’t store) about you. They keep no logs detailing internet traffic, number of sessions, DNS server requests, timestamps of connections, et cetera. Which every privacy-loving user will greatly appreciate. On the other hand the company makes it very clear they will comply with government agencies’ lawful requests for information. Offering servers in countries where they are used has a significant upside. You’re able to watch US Netflix through American servers, or stream BBC iPlayer programs through a UK one. Also local, smaller streaming servers usually have a server nearby. 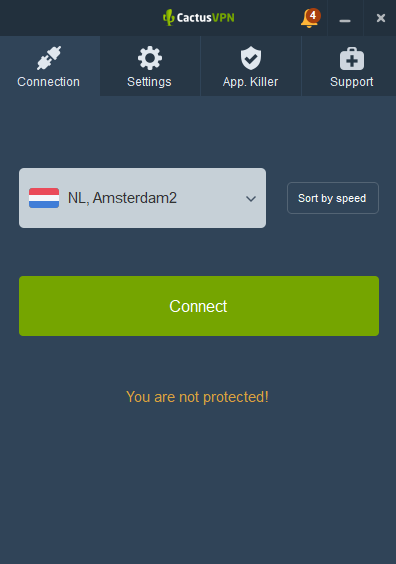 Using Bittorrent is only allowed on Dutch and Moldovan VPN servers, which, in the case of The Netherlands, is slightly amusing because of recent changes in laws concerning downloading. CactusVPN’s clear log policies however make streaming a relatively safe option, and server connections and speeds perform admirably, in general. The company does however reserve the right to slightly squeeze your connection if other users experience speed drops due to your download activities. 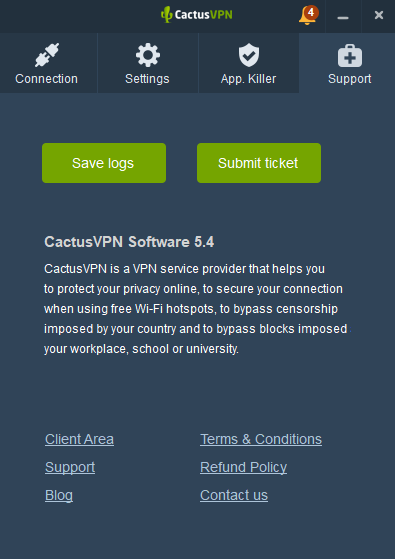 CactusVPN has a ticket system online that helps you with most of your queries. These automated email forms usually direct you to tech assistance, providing quick answers to the basis questions. A live chat is available during Moldovan office hours, which, of course, is great for people living in the Eastern European Timezone, and less so for others. The website also has a support page with FAQ’s. CactusVPN distinguishes itself from the competition by making a very specific offer. The ability to pay only for the servers or services you actually use is very interesting, and will probably draw customers from other VPN-providers. Use VPN only for US Netflix? Then CactusVPN is simply the best option for the best price. On the other hand we find the full subscription package. Although CactusVPN’s quality is good, the price is a bit steep, especially considering the number of available servers. Opt for a yearly subscription, and the price drops considerably, but still. CactusVPN pleases us greatly on the performance side. Its security is tight, and the service doesn’t log your activities. 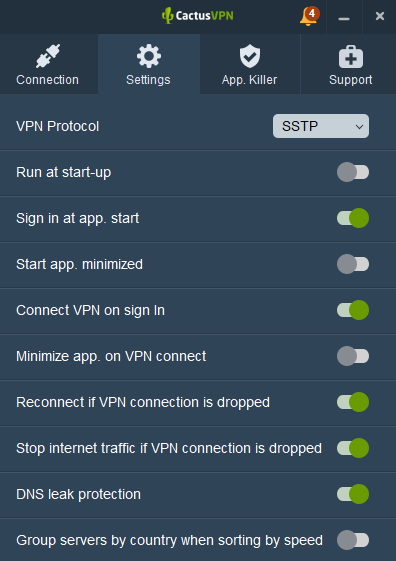 If you’re looking for a VPN that provides a safe, anonymous browsing service with plenty of functionalities, CactusVPN is a very good option.